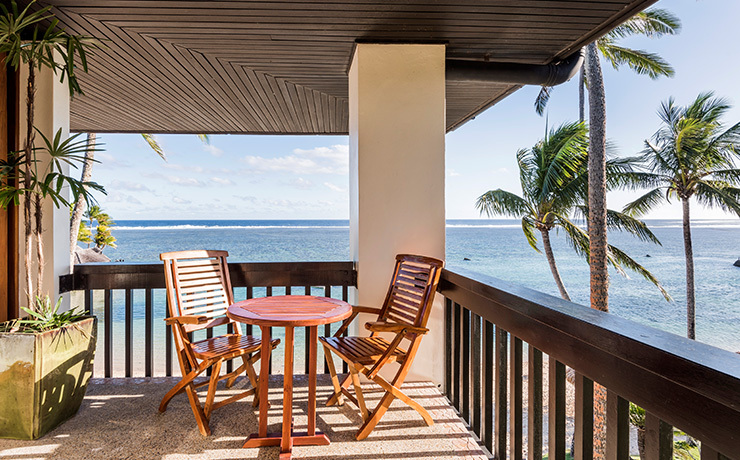 Holiday makers looking for a touch of something special on their next Fijian getaway need look no further than the Coral Coast's The Warwick Fiji. Trust us, you'll never want to leave this beautiful resort, and when you see the awe-inspiring views you'll understand why. 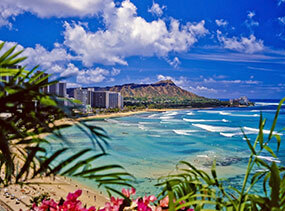 Located amongst sandy beaches and tropical flowers, the resort has everything you could ask for in island living. 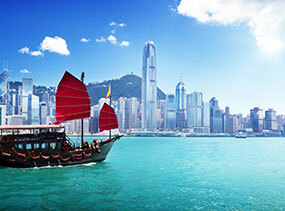 The staff are exceptionally friendly and the facilities are second to none, making it tough to drag yourself away at the end of a well-deserved holiday. If you are tempted to stray from your accommodation, head to the local Fijian villages for a taste of the traditional way of life. Make sure you take in the Biausevu Waterfall, and dive into the Bega Lagoon to get a close up look at some of Fiji's most amazing tropical fish. Once you return to your room, you'll fall in love all over again with the sweeping ocean and garden views, complemented by the rooms' elegant styling and array of creature comforts. Air conditioning takes the edge off the tropical summer heat, while coffee makers and mini-bars are available to treat those who want a taste of home. Drop the kids off with an on-site baby sitter or take them to the supervised Kids' Club before you sneak away to the swimming pool for an afternoon of child-free bliss. Throw in a cocktail at the swim-up bar and you've got a recipe for holiday success! Just don't forget to pick the kids back up afterwards. Sporty types will love the flood-lit tennis courts, 18-hole miniature golf course and archery available at the resort, with the added bonus of glass wall squash courts to really sweat out that pina colada. Follow an exercise session with some pampering at The Warwick Fiji and return from your holiday feeling refreshed and revitalised - and aching to go back! Located on a white sand beach with clear lagoon waters, this large resort is located a 90 minute drive from Nadi, and offers a wide range of activities to keep you entertained. 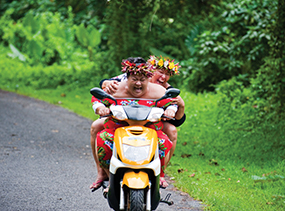 You can never run out of things to do at The Warwick Fiji. 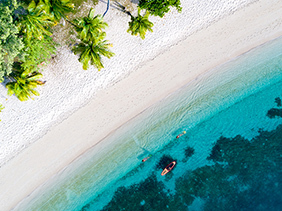 The Warwick Fiji offers a wide range of land and water activities designed to keep guests entertained and occupied throughout their stay in this tropical paradise. The resort includes a number of stunning fresh water swimming pools. 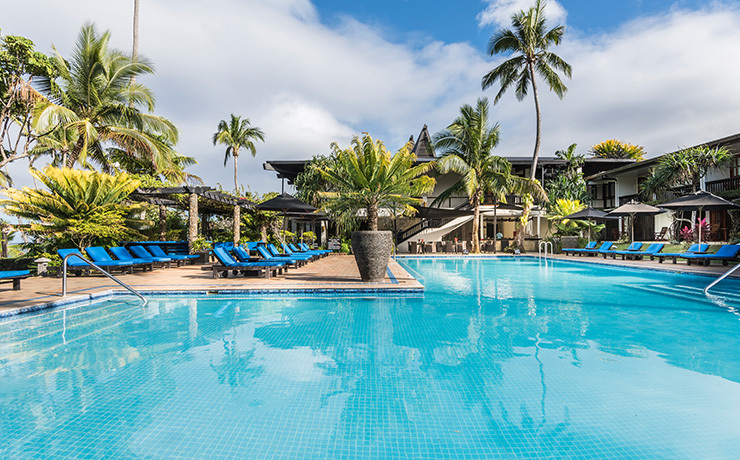 The Nadi Wing pool is the main meeting place, where guests can indulge themselves in a game of pool volleyball or simply relax by the swim-up pool bar. Kids can enjoy themselves in the kids pool or join their parents in the Jacuzzi. 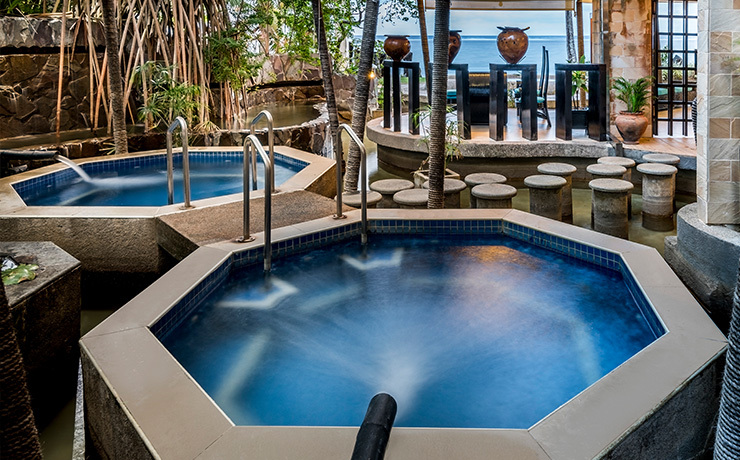 For a quieter day, the Suva Wing pool is the perfect choice. Feel like some pampering then the Warwick Fiji spa is a must, where a fusion of Polynesian architecture and open-concept design together creates a totally rejuvenating spa experience. Built overlooking the tranquil lagoon, you will delight in an incomparable spa experience fit for royalty. 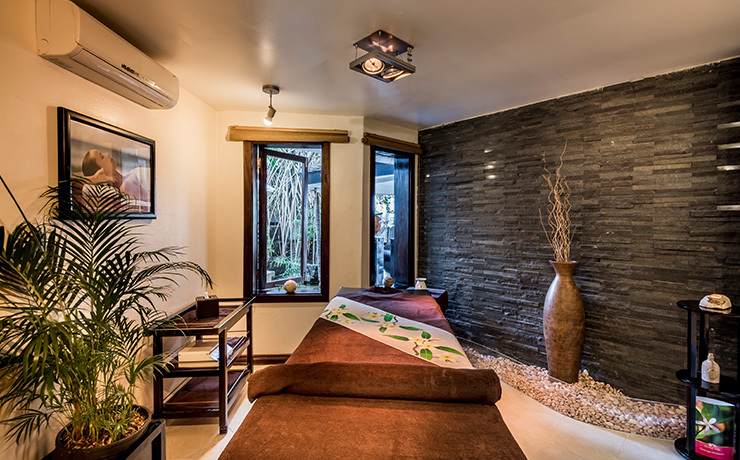 Offering excellent outdoor hot and cold pools, 4 massage/treatment rooms, sauna rooms, manicure and pedicure room and all natural aromatic spa treatments. You can be sure to receive the ultimate rejuvenating experience. The Warwick Fiji also offers 4 flood lit tennis courts, 18-hole miniature golf course, horse riding on the beach, archery, village tours, hiking, a fully equipped fitness gym, as well as being the only resort in Fiji to have 2 glass wall squash courts. Boasting the best golden sand beach with crystal clear lagoons, all water activities are non-motorised with a selected few available from the beach office on a complimentary basis. 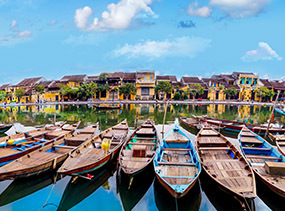 Water activities include canoeing, fish feeding, glass bottom boat rides, paddle boats, wind surfing, bay fishing, scuba diving and even the option of white water rafting for the more adventurous traveller. 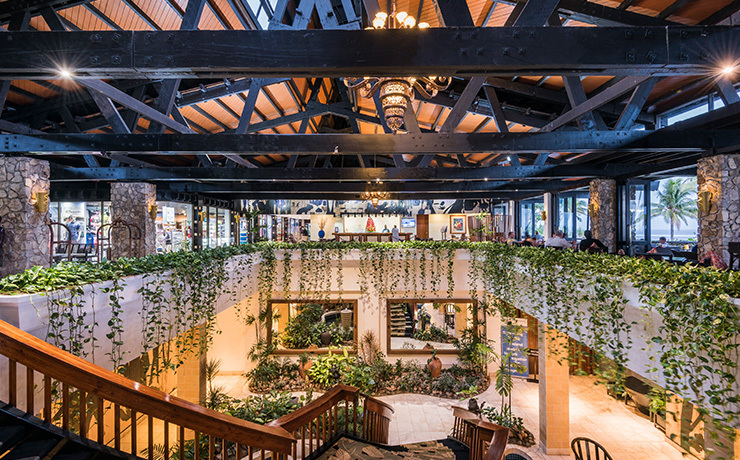 The resort offers a fine selection of exquisite dining experiences, including Italian, Japanese, fresh seafood and nightly international themed buffets. 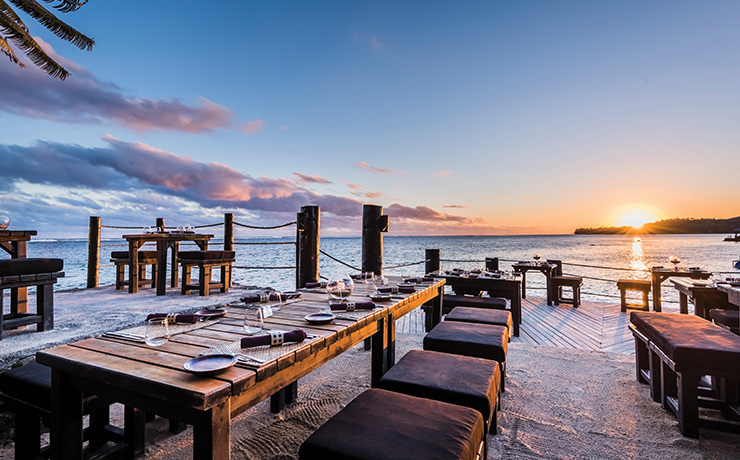 The Warwick Fiji Resort is home to one of Fiji's most elegant seafood restaurants, the Wicked Walu, set on its own private island and connected to the resort by a causeway. 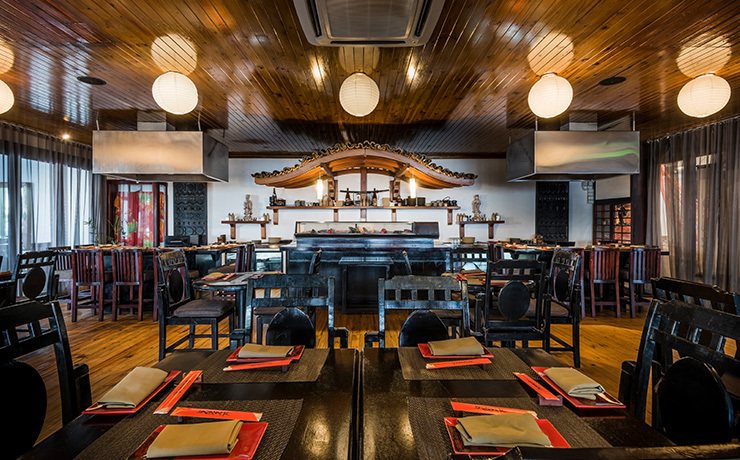 Other choices in the resort for that perfect dining experience include Pappagallo, the Italian restaurant, Sazanami for that taste of Japan, or Bula Brasserie where hotel guests can feast on a traditional Fijian buffet amongst other international themed cuisine. The Warwick Fiji also features the Sunset Bar, Hibiscus Bar & Lounge, Lagoon Bar & Grill, and the swim-up Pool Bar, where you can enjoy your favourite exotic cocktail or ice cold beverage whether you're in the pool, overlooking the beach or dancing the night away. You'll never be bored at The Warwick Fiji with entertainment options to fill your holiday all day and night long. 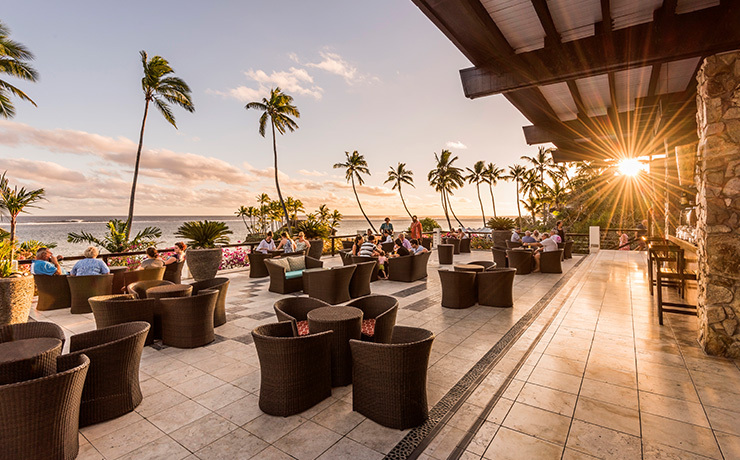 Guests can enjoy the live band and DJ entertainment while dancing the night away at the Hibiscus Lounge, or experience traditional Meke entertainment on Friday Fijian Night at Bula Brasserie. 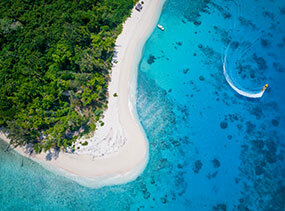 At The Warwick Fiji you'll be spoilt for choice with entertainment options. 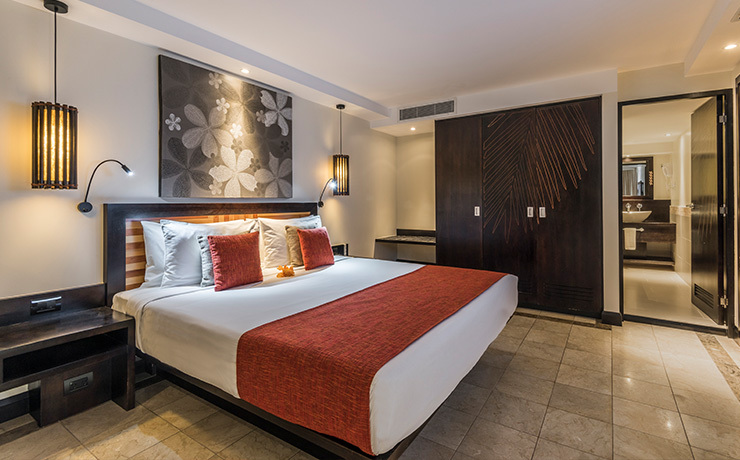 Each one of The Warwick Fiji 250 well appointed rooms and deluxe air-conditioned suites reflect the resorts true tropical ambience and feature soothing decor, personal touches such as fresh flowers and private balconies with mountain and ocean views. 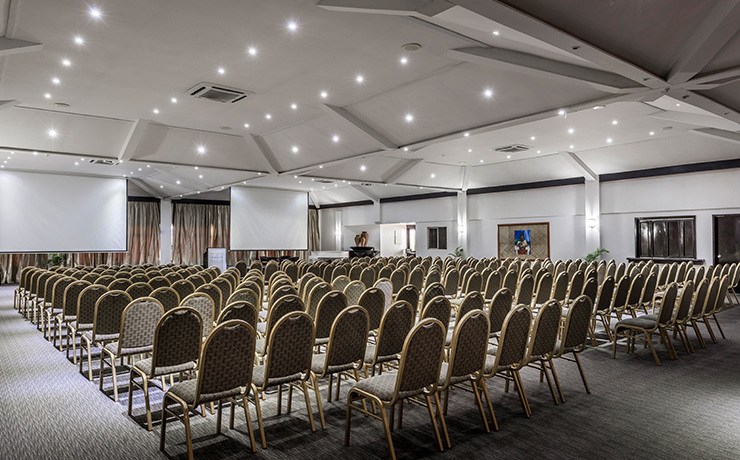 Amenities include tea/coffee making facilities, fully stocked mini-bar, digital in-room safe, ironing facilities, 16-channel satellite television, hair dryer, IDD telephones and 24 hour room service. 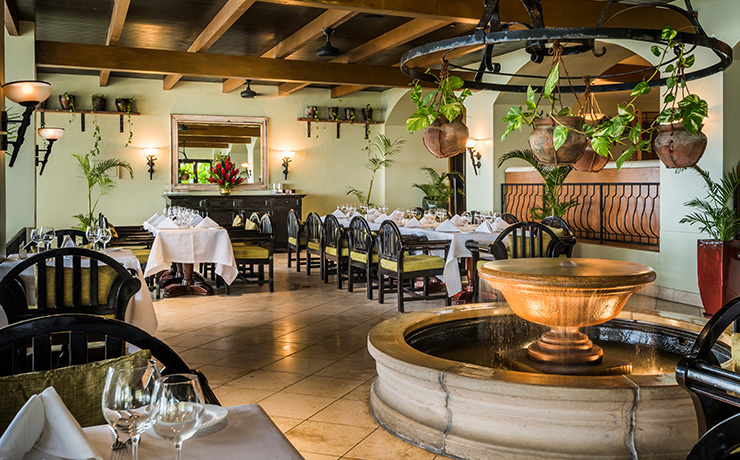 Garden View rooms are located on the ground and first floor of the Nadi and Suva wings. 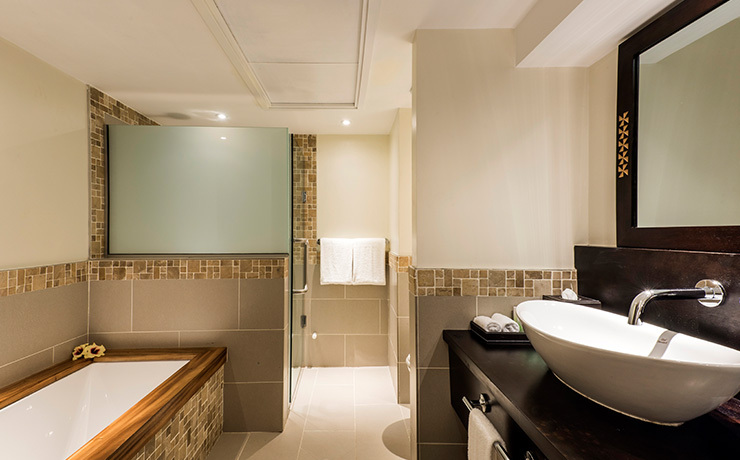 These rooms all feature 2 x double beds with interconnecting facility on selected rooms. 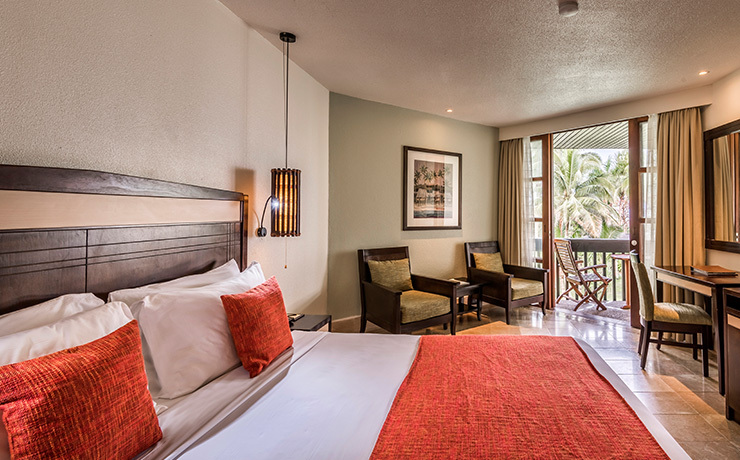 Ocean View rooms feature either Queen/Single bedding or 2 double beds with soothing decor reflecting the resorts true tropical ambiance. 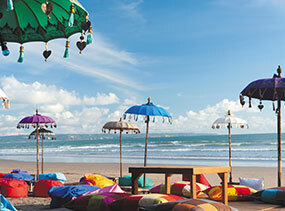 Selected Ocean View rooms also offer disabled and interconnecting facility. Warwick Deluxe rooms are our adults only rooms, ideal for honeymoon couples or guests preferring to be on the quieter side of the hotel. All Club rooms have either one king-size bed or 2 double beds. Suites all feature a separate lounge, with sofa in the lounge and bedroom with one king-size bed. Your kids will be well entertained at the KARE Club with a variety of games. fishing and handicrafts. The club is open daily for children between the ages of 3-11 years. 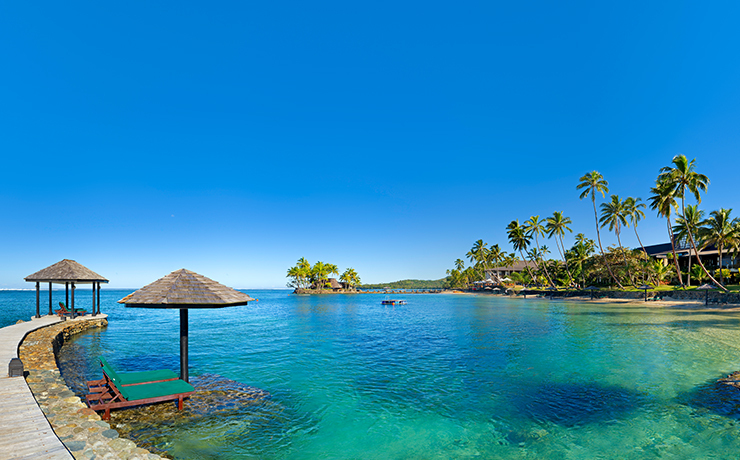 KARE Club provides parents an escape to use the resorts many fantastic facilities, whilst ensuring that your kids are cared for with the genuine hospitality and warm friendliness that the Fijian people are known for. At the club, kids involve themselves in activities like handicraft making, fish feeding and Meke, sandcastle building, crab hunting, seashell collecting, face painting, treasure hunting and much more. Further baby sitting services are also available. Valid for travel from 01 Apr 13: Up to 2 children under the age of 13 years sharing a room with parents stay free plus eat free from the kids buffet from 5.30pm - 7.30pm or any children's menu. Imagine an unforgettable fairy-tale wedding ceremony in the resorts Florentine garden, on the beach or in our private island the Wicked Walu complete with frangipani, gardenia, orchids, roses and anthuriums to complement the occasion. Nestled amidst lush tropical gardens on the edge of a golden sand beach overlooking the tranquil lagoon, the 4.5 star The Warwick Fiji is the ultimate escape for an unforgettable romantic rendezvous. With options including a picturesque island wedding or a tropical beach setting, a The Warwick Fiji ceremony promises you the pleasure of being pampered in paradise with memories to last you a lifetime. 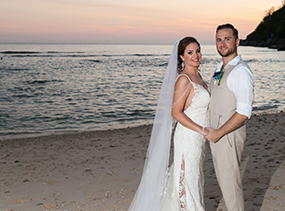 From simple private affairs to the more elaborate family occasion, The Warwick Fiji will tailor make every special wedding occasion to the couple's liking with the promise of beautiful memories that will last them a life time. Choose from wedding options and packages including Fijian Warrior escorts and bilibili (traditional Fijian bamboo raft) for bridal entrance, serenades for ceremonial service, wedding cake, traditional Fijian costume, bridesmaids bouquet, photography and video shooting and more. 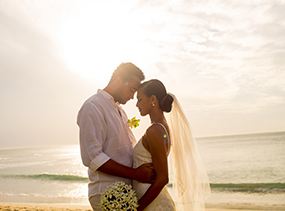 The Warwick Fiji is the memorable choice for your perfect Fiji Island wedding.